I really like Brownies so I'm always thinking of different ways to present them. Since they're really like a very dense chocolate cake, I thought why not make them into cupcakes. And these cupcakes give you a double dose of chocolate, as they're topped with a chocolate fudge frosting. Delicious. The batter for these Brownie Cupcakes is easily made in one bowl and a hand mixer is entirely optional. The chocolate and butter are first melted together. Then, all you need to do is whisk (or stir) in the rest of the ingredients. That is it. We are using unsweetened chocolate in this recipe which is also known as baking, plain or bitter chocolate. This is chocolate in its rawest form which means it is just ground cocoa nibs that have been refined and contain between 50-55% cocoa butter (cocao fat). Since no sugar is added to the chocolate it has a strong, bitter taste that is used in baking but is never eaten out of hand. The chocolate fudge frosting for these Brownie Cupcakes is so creamy and smooth. It contains only four ingredients, chocolate, butter, confectioners (icing or powdered) sugar, and vanilla extract. I like to use unsweetened chocolate but you can use either semi sweet or bittersweet chocolate although the frosting will be sweeter tasting. The important thing to remember when making this frosting is to let the melted chocolate cool to room temperature before adding it to the frosting. Otherwise the frosting may be too soft for piping. But if this happens, simply refrigerate the frosting until it is firm enough to spread or pipe. 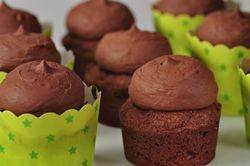 Brownie Cupcakes: Preheat your oven to 325 degrees F (165 degrees C) and place the oven rack in the center of the oven. Butter (or spray with a non stick cooking spray) or line 12 muffin cups with paper liners. Melt the chocolate and butter in a stainless steel bowl (heatproof bowl) placed over a saucepan of simmering water. Then remove from heat and let cool to lukewarm. Then whisk or stir (can also use a hand mixer) in the sugar. Add the vanilla and then add the eggs, one at a time, mixing well after each addition. Scrape down the sides of the bowl as needed. Mix in the flour and salt until well blended. Evenly divide the batter between the muffin cups. Place in the preheated oven and bake for about 20 minutes or until a toothpick inserted in the center of a cupcake still has moist crumbs clinging to it. Remove from oven and let cool on a wire rack. Once the cupcakes have completely cooled, frost with the icing. You can either spread the frosting on the cupcakes with a small spatula or if piping, using a large plain or star tip. In the bowl of your electric mixer, or with a hand mixer, beat the butter until smooth and creamy (about 1 minute). Add the sugar and vanilla extract and beat until light and fluffy (about 2 minutes). Add the melted chocolate and beat on low speed until incorporated. Increase the speed to medium-high and beat until frosting is smooth and glossy (about 2 -3 minutes).